Human saliva which helps to maintain physiological functions of oropharyngeal structures contains cariogenic trace elements such as lead, cadmium, selenium, sodium, magnesium, and cariostatic elements such as calcium, phosphate, and strontium. Very few studies were undertaken to know about these trace elements and their effect on oral health including dental caries. One of these trace elements, lead is present in all biological materials such as soil, water, plants, and animals but has no physiological function in the organisms. The main sources in humans include diet, paint, hair dyes, water pipelining, battery, and vehicle exhaust. Lead at a concentration of 10 μg/dL in children and 50 μg/dL in adults is reported to be harmful. Lead toxicity may lead to a wide range of brain dysfunction such as mental retardation, cerebral palsy (CP), hyperactivity, intellectual disabilities, learning difficulties, and dental pathologies. A variety of biomarkers are available to detect and monitor human exposure to lead which include blood, hair, urine, tooth, bone, and saliva. Lead has a great affinity for hydroxyapatite even at low concentrations making teeth examination useful in assessing postexposure and accumulation of lead in the enamel and body. Salivary lead detection is an effective, valuable, noninvasive, easy, and convenient (especially in children during dental assessment and for periodic collections) method with good predictive values, especially in large population screening. Therefore, in our study, we have used dental assessment and salivary lead concentration as a predictor of lead toxicity and dental caries. Lead exposure during intrauterine development can cause neurological disabilities including CP. CP is a nonprogressive central nervous system (CNS) disorder of tonus, posture, and movement occurring due to insult to the immature brain. Any condition capable of injuring the CNS, particularly the brain, between conception and infancy is considered an etiological factor of CP. Hence, the role of lead, as a causative agent was kept as objective in this study. CP per se does not predispose patients to caries or periodontal disease; however, socioeconomic and cultural factors influence the occurrence of these conditions such as a lack of orientation regarding the ingestion of cariogenic foods and inadequate oral hygiene, and role of lead as cariogenic factor. Hence, the objective of the present study was to estimate and compare the salivary lead level in normal and neurologically disabled children and to correlate salivary lead level with dental caries in both normal and neurologically disabled children. The study included 86 children; 41 normal and healthy children were selected randomly from the Department of Pedodontics, P.M.N.M Dental College, Bagalkot and 45 children with CP, were selected from S. P. Institute of Neurosciences, Solapur, who visit this hospital for the purpose of treatment and follow-up. Children from 5 to 12 years of age with no systemic diseases were included in the study while those who were uncooperative, not willing to fill the questionnaire and those without parental consent were excluded from the study. Informed consent was obtained from their parents, respective schools, and institutions. In all the individuals, a thorough medical history was taken by making parents of all children answer a questionnaire enquiring about the child's birth history, child's food habits, and the source of domestic water supply. At the same time, child's decayed, missing, and filled teeth (DMFT) score was recorded. Dental examination was done using sterile mirror and a portable light torch. Oral findings were recorded in term of the age, state of dentition, presence or absence and the level of caries in all individuals by the same examiner. All children were divided into four groups depending on the presence or absence of dental caries. Group 1 consisted of 20 normal children with dental caries, Group 2 consisted of 21 normal children without dental caries, Group 3 consisted of 25 CP children with dental caries, and Group 4 consisted of 20 CP children without dental caries. The salivary samples were collected from all the children to estimate salivary lead levels. Data collected were grouped, tabulated, compared, and subjected to appropriate statistical analysis. The unstimulated saliva was collected first by requesting the subject to sit in a quiet environment in the “coachman” position and expectorate into a plastic bottle. Samples were collected between 9–11 AM. Each individual was instructed to wash and rinse his/her mouth with water several times to ensure the removal of any possible food debris and contaminating materials and asked to accumulate saliva in their mouth by spitting method, he/she spitted the saliva into plastic bottle. All saliva that accumulated within the oral cavity for a total of 5 min was collected into the container, at intervals of 30 s. The collected saliva was carried to the deep freezer in a portable icebox (vaccine carrier) for storage, maintaining a temperature of 0 to −4°C. Saliva sample digestion for lead estimation was done wherein five ml of the saliva was treated with 1 ml of concentrated nitric acid and 100 ml of hydrogen peroxide. It was then heated on a hot plate at 200–250°C until destruction was complete, where the remainder became dry and was allowed to cool. Then, the old residue was dissolved with 1 ml of 2.5% (V/V) nitric acid, diluted to 5 ml with deionized water, transferred into a tube with a screw cap and sealed with a paraffin sheet. Moreover, it was taken to the atomic absorption spectrophotometer (GBC 632) where saliva lead estimation was done. The mean lead concentration, standard deviation, mean values, and coefficient of deviation in each of the four groups were tabulated as shown in [Table 1]. Pair-wise comparison with respect to lead concentration scores was done by Tukey's multiple post hoc procedures. [Table 1] shows mean and SD of lead concentration in healthy and CP children with and without caries groups. The mean standard deviation of healthy children with caries was 0.42 and the mean standard deviation of healthy children without caries 0.28, whereas the mean standard deviation in children with CP with caries was 0.09 and the mean standard deviation CP without caries was 0.20. The mean values of healthy children with dental caries were 1.12, the mean value of healthy children without caries was 0.28, whereas the mean values in children with CP with caries were 1.00 and the mean values in children with CP without caries was found to be 0.77. When the lead concentration was compared between healthy children with caries and healthy children without caries, the results were statistically significant (P = 0.0001*), when healthy children with caries (G1) were compared with CP children with caries (G3), the results were not statistically significant (P = 0.4396). When healthy children with caries (G1) were compared with CP children without caries (G4) the result was statistically significant (P = 0.0002*). The comparison of healthy children without caries (G2) and CP children with caries (G3) shows the statistical significance (P = 0.0001*). However, when the CP children with caries (G3) were compared with CP children without caries (G4), the results were statistically significant (P = 0.0150*). Special and medically compromised patients present a unique population that challenges the dentist's skill and knowledge to achieve and maintain good oral health. One of the most common forms of neuromuscular disabilities affecting children is CP, the worldwide incidence being 2–2.5 per 1000 live births. CP is a nonprogressive CNS disorder of movement, coordination, and posture occurring due to perinatal insult to the immature brain. Prenatal risk factors associated with CP include teratogenic substances and exposure to toxins, emphasis has been made on one of them, i.e., lead, as one of the etiologic factors for CP in this study. Lead exposure comes from multiple sources because lead has been used for many centuries for many purposes. Nutritional status and eating behavior appear to influence the absorption and toxicity potential of lead in several ways. Lead ingested from water and other drinks and on empty stomach is absorbed to a greater extent. Lead also interacts with several essential elements notably calcium, iron, ascorbate and zinc, and dietary deficiencies of these are known to enhance the absorption of lead, which can be the most common reason for increased susceptibility of children especially those with CP to lead exposure. Thus, the centers for disease control and prevention has made an educational effort to foster proper nutrition among children, particularly urging parents to assure an adequate daily supply of iron and calcium to help reduce lead absorption. In our study, a questionnaire asking for details regarding the type of housing, racial/ethical subgroups, and socioeconomic status was used which showed no significant correlation with lead levels. Children, especially those with CP, are more affected to lead exposure and toxicity due to their behavior such as mouthing, hand-to-mouth behaviors, and pica, physiology like higher breathing rate and greater lead absorbance, increased organ sensitivity to high blood lead levels and incomplete development of blood–brain barrier in fetuses. Lead affects every one of the body's organ systems, especially the nervous system, but also the bones and teeth, the kidneys, and the cardiovascular, immune, and reproductive systems. Increased blood lead level in children has been correlated with learning disabilities, hearing loss, tooth decay, decreases in intelligence, nonverbal reasoning, short-term memory, attention, reading and arithmetic ability, fine motor skills, emotional regulation, academic performance, and social engagement. Between the blood lead levels of 5 and 35 μg/dL, an IQ decrease of 2–4 points for each μg/dL increase is reported in children. The health effects experienced by adults are similar to those in children, although the thresholds are generally higher. The amount of lead in the blood and tissues, as well as the time course of exposure, determines toxicity. Significant rise in the levels of lead concentration along with the rise in DMFT scores could be due to environmental exposure of individual to atmosphere including those of through air, water, and soil. Saliva serves as a mirror of the body's health, as it contains various protective and also risk factors which contribute to dental diseases, especially dental caries. Hence, the evaluation of those factors in saliva that may increase the risk of individuals to dental caries can pave the way to make recommendations that will cater specifically to the needs of an individual. In dentistry, several important aspects, such as the ability to maintain oral hygiene dental caries, and periodontal conditions, increased the tendency toward trauma secondary to malocclusion have been seen in individuals with CP. Our study showed high DMFT/def values in CP patients which were statistically significant when compared to healthy children [Figure 1]. This was in accordance with studies done by Altun G, Shyama M, Rodrigues dos Santos MT, Al-Mutawa SA.,, Studies by Maria Teresa Botti Rodrigues dos Santos showed that risk factors such as high mutans streptococci and lactobacillus counts, high plaque values, and low salivary flow rates can explain the associated with caries prevalence in CP children. Increased concentration of lead in high DMFT/def individuals can be due to mimicking the action of lead as calcium and because of its property of getting substituted to calcium ions. High DMFT/def values in CP children can be due to poor neuromuscular coordination, poor oral hygiene practices, and lack of awareness on the part of parents. Another contributory factor is the sweetened medications (carbamazepine most commonly and sometimes even herbal formulation) given to them to control seizures and other medical problems. The prescribed anticonvulsants are sweetened, highly viscous and used at night, which enhances the progression of dental caries. As more and more individuals who have CP continue to live in community settings, rather than institutions, and as their life spans increase, dentists and hygienists will be responsible for providing a continuum of oral health care to this population from childhood through later life. Early rehabilitation, intervention, and prevention are important for these individuals. The conflicting results verified in different studies were probably due to different characteristics of the studied populations, different control groups, shorter duration of exposure of erupted permanent teeth at younger age, methodology variation, different geographical areas chosen for the study, nonstandardized criteria used for diagnosis, absence of control groups, and lack of statistical analysis of the results. In addition, no single salivary component in vivo is particularly significant in determining caries risk. Thus, further experimental and clinical studies are needed for progress to assess the potential activity of lead against dental caries and to clearly establish the facts between the variables. Lead toxicity which causes a range of health hazards including brain and dental pathologies is strongly associated with dental caries especially in children with CP. Salivary lead concentration is directly proportional to the DMFT scores. High DMFT scores in CP children can be due to poor neuromuscular coordination, poor oral hygiene practices, and lack of awareness on the part of parents. CP children are more prone to dental caries and increased salivary lead concentration which could be a cause as well as the effect of CP. More studies are warranted regarding lead concentration and CP due to the inconclusive results in the literature. Navia JM. Prevention of dental caries: Agents which increase tooth resistance to dental caries. Int Dent J 1972;22:427-40. Cohen AJ, Roe FJ. Review of lead toxicology relevant to the safety assessment of lead acetate as a hair colouring. Food Chem Toxicol 1991;29:485-507. Brudevold F, Aasenden R, Srinivasian BN, Bakhos Y. Lead in enamel and saliva, dental caries and the use of enamel biopsies for measuring past exposure to lead. J Dent Res 1977;56:1165-71. Souza AL, Horta CA, Silva CA, Miranda DK. Saúde bucal de pacientes portadores de necessidades especiais com paralisia cerebral. Rev Paraense Odonto 1997;2:11-8. Canfield RL, Henderson CR Jr., Cory-Slechta DA, Cox C, Jusko TA, Lanphear BP, et al. Intellectual impairment in children with blood lead concentrations below 10 microg per deciliter. N Engl J Med 2003;348:1517-26. National Institute of Dental and Craniofacial Research. Practical Oral Care for People with Cerebral Palsy. NIH Publication No. 09-5192. Bethesda, MD: National Institute of Dental and Craniofacial Research; 2009. Jones MW, Morgan E, Shelton JE. Primary care of the child with cerebral palsy: A review of systems (part II). J Pediatr Health Care 2007;21:226-37. ATSDR. Agency for Toxic Substances and Disease Registry. Case Studies in Environmental Medicine: Lead Toxicity. U.S. Department of Health and Human Services; 1992. Goyer RA. Toxic effects of metals. In: Klaassen CD, editor. Casarett and Doull's Toxicology: The Basic Science of Poisons. 5th ed. New York: McGraw-Hill; 1996. ATSDR. The Nature and Extent of Lead Poisoning in Children in the United States: A Report to Congress. Agency for Toxic Substances and Disease Registry. Atlanta, GA: U.S. Department of Health and Human Services, Public Health Service, Centers for Disease Control; 1988. White LD, Cory-Slechta DA, Gilbert ME, Tiffany-Zawia NH, Virgolini M, Rossi-George A, et al. New and evolving concepts in the neuro toxicology of lead. Toxicol Appl Pharmacol 2007;225:1-27. Brunton Goodman LS, Blumenthal D, Buxton I, Parker KL, editors. Principles of toxicology. Goodman and Gilman's Manual of Pharmacology and Therapeutics. California, USA: McGraw-Hill Professional; 2007. p. 1131. Gopinath V K, Arzeanne AR. Saliva as a diagnostic tool for assessment of dental caries. Arch Orofac Sci 2006;93:436-9. Altun C, Guven G, Akgun OM, Akkurt MD, Basak F, Akbulut E, et al. Oral health status of disabled individuals attending special schools. Eur J Dent 2010;4:361-6. Shyama M, Al-Mutawa SA, Morris RE, Sugathan T, Honkala E. Dental caries experience of disabled children and young adults in Kuwait. Community Dent Health 2001;18:181-6. Dos Santos MTBR, Masiero D, Simionato MRL. 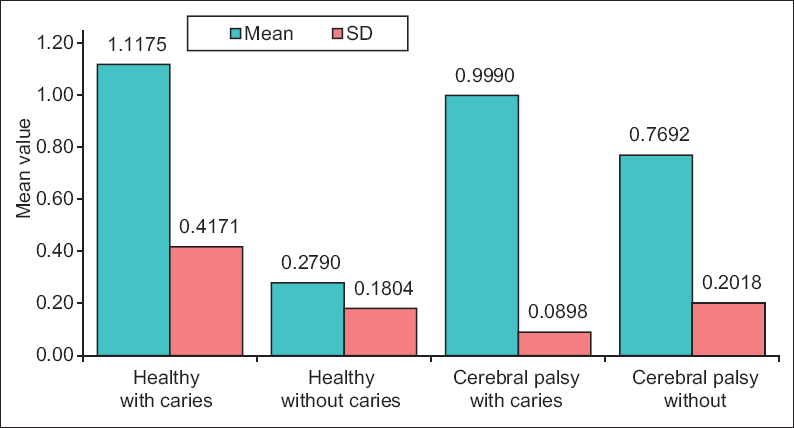 Risk factors for dental caries in children with cerebral palsy. Spec Care Dent 2002;22:3-10. Jones MW, Morgan E, Shelton JE, Thorogood C. Cerebral palsy: Introduction and diagnosis (part I). J Pediatr Health Care 2007;21:146-52.